Geese Theatre Company was founded in Birmingham in June 1987 with belief in the power of theatre to change people’s lives. 30 years on, our home is still in Birmingham but our team work nationally with some of the most marginalised and isolated people in the UK. Our performances and projects allow people to explore their own journeys and tell their stories. Since 2013 an intrepid band of Geese friends, family and staff have taken part in personal challenges to raise vital funds for our work. They have smashed the Birmingham Half Marathon every year and raised over £15,000! 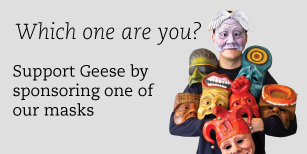 To join Team Geese you don’t have to be a runner, or an athlete of any kind! If you have an event or challenge in mind and would like to raise funds for Geese then we’d love to have you. Many thanks to all who have supported our work. Without your help, we could not reach as many people - you really do help to change lives. 29th May 1961 Charitable Trust, Barrow Cadbury Trust, BBC Children in Need, Bromley Trust, Calouste Gulbenkian Foundation, Dumbreck Charity, Edgar E Lawley Foundation, Eveson Charitable Trust, Grimmitt Trust, Paul Hamlyn Foundation, William Adlington Cadbury Charitable Trust. Geese Theatre Company is an Arts Council England National Portfolio Organisation.